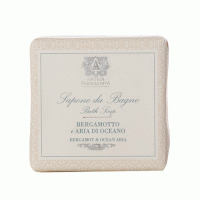 Bergamot & Ocean Aria A beautiful fragrance built on the allure of the ocean and its captivating ambiance. 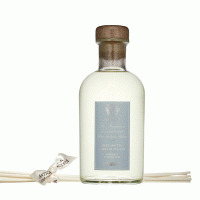 Fresh ozonic saltwater notes blend with soft jasmine and lavender while crisp bergamot adds a glistening effervescence. Soft warm notes of white musk and lush oakmoss complete this captivating scent. A premium, clean burning soy/paraffin wax blend with all-natural, lead-free wicks. Provides approximately 60 hours of brilliant fragrant splendor for the home. Created in Antica's signature fragrances of Orange Blossom, Lilac & Jasmine, Green Fig and Champagne. Packaged exquisitely, this candle makes the perfect gift for any occasion.